Q. Why do so many people make complaints to the Parliamentary and Health Service Ombudsman when there is no merit to their complaint? It’s odd isn’t it, we British are not a nation of whingers. If someone treads on our toes we are the ones to say sorry. Yet for some inexplicable reason, nearly 30,000 of us make mainly spurious complaints to the Ombudsman. If the uphold rates are to be believed we are a nation of vexatious fools. 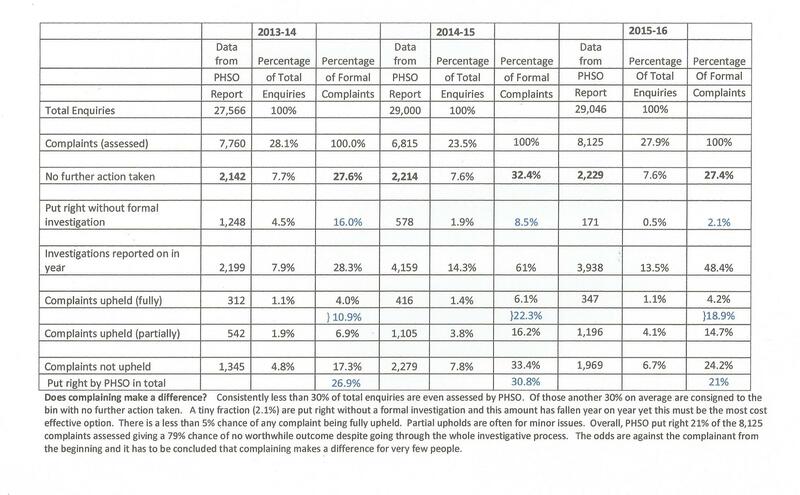 In 2014/15 PHSO received 6,920 parliamentary complaints. Of these, just 885 (12.7%) were investigated and a mere 323 (4.6%) upheld to some degree. 95% of the people who complained did so without just cause. In 2015/16 PHSO received 6,323 parliamentary complaints. Of these, just 649 (10.2%) were investigated and a minuscule 279 (4.4%) upheld to some degree. Once again over 95% of the people who took the time and trouble to pursue a complaint over many months or years did so for no good reason. Just time wasters with nothing better to do than write letters and moan. So here is the big question Mr. Behrens, is it that year on year the British public make false claims and simply waste public money on vengeful complaints. Or is it that PHSO act with bias towards the public bodies, skewing the data in their favour? So, Mr. Behrens, if you are looking for bias what form would it take? 1. Failure to investigate valid complaints. PHSO regularly find any excuse to put the complainant back to the original body complained about (unless they are trying to meet their 4,000 cases investigated target by the end of the financial year of course). There must be oodles of evidence for this in those stored PHSO case files. Just take a look at this data regarding complaints made about the Information Commissioners Office (ICO). Complaints about ICO from 2007 If you look at 2016, the last data recorded, you will see that 98 complaints were made about ICO in that year, only 6 (6%) have been investigated and to date no upholds. Don’t look and you don’t find. Ombudsman legislation states that the complainant must approach the Ombudsman within twelve months of first knowledge that something was wrong. That is an arbitrary date which should be changed to 12 months from final closedown of initial complaint. Although the complainant may give a date that they were first aware it has been known for the Ombudsman to disagree and consider a different date to be the most likely and use that to invalidate the complaint. PHSO also give advice to public bodies on using ‘time out’ procedures as you can see here. 3. Failing to take account of any evidence which does not fit the chosen narrative. There are many examples of this which is no doubt why ignoring evidence was top to the Patients Association list. Here are a few to start you off. ..we cannot question “discretionary” decisions made without maladministration. The fact that your adviser has a different opinion on the available evidence does not in itself mean that there was fault in the decision-making process. PHSO ignored written evidence from GP’s, health records, hospital records and solicitors’ letters, which all disputed their findings. You have stated a number of points disagreeing with our decision on the dosage of rotigotine and Madopar, including disagreement with our adviser’s opinions. We have noted the guidance you have referred to in relation to these aspects, both the recommended dosage of the rotigotine patches and the Parkinson’s UK document. We acknowledge your view. However our advisers are very experienced physicians and we have no reason to question their clinical view, both in relation to the dosage of the Rotigotine patch and the Madopar. We are satisfied that our advisers were aware of and referred to all the relevant guidance and standards that apply to the issues we looked at. Therefore we will not comment any further on this and our decision remains unchanged. The first PHSO investigation finalised on 23 July 2013, investigating officer XXXX, didn’t use the statement from a Judge, stating that the court deemed that my husband lacked capacity (23 December 2011), the CMHT deemed my husband fit, well and in sound mind and body with full capacity and discharged him from their care as fit and well on 22 December 2011. He was in court with me on 23 December the day after the Trust declared him well on every front, sat in a wheelchair, with second-degree burns to his feet, looking as though he was going to lose his foot, emaciated and completely bonkers, the court ushers mentioned he was quite delusional. This wasn’t used in the report. 4. Finding no link between maladministration and harm. This requires some crystal ball gazing but evidently, PHSO are expert at predicting that the harm would have been caused in any event or that it cannot be proved that the action caused the harm even when the balance of probabilities is overwhelming. ‘we are unable to explain why you were fine before the smear test and were in pain later. We recognise that this will be frustrating for you. We asked our advisor if there was any further explanation she could add and she reiterated that the speculum examination will not have been the cause of your persistent pain. It would be inappropriate for us to try to offer you an explanation as this would be speculation’. The first report found that, ‘The medical care fell so far short of the applicable standards at to amount to service failures’, and ‘The nursing care fell so far short of the applicable standards as to amount to service failures’. That part was upheld, but it was stated that even if my husband had of received the correct diagnosis, which was changed from the diagnosis he ended up with back to the correct diagnosis after the investigation, that we would never know if the outcome would have been different. This was based on ‘probability’, and the report stated that the injustice we suffered was that we would never know if things would have been any different. 28 – “we consider we cannot prove that the long term problems you have reported were caused by clinical failings from the Trust(in part because your operation records were lost)”. You may have presented conclusive evidence of appalling practice yet if the public body inform the Ombudsman that they have since ‘put things right’ there will be no uphold recorded in your case. It needs to be noted here that PHSO have no remit to check that appropriate actions have been taken and neither do CQC follow up the supposed action plans. You disagree with our findings on the care provided to your mother with regards to her pressure sore. As our report explains, there is evidence in the medical records that podus boots were used. We are unable to say which particular type was used as there are many but the evidence shows podus boot was used. We found that the foot drop could have been prevented with regular observation and physiotherapy. However, the Trust have already taken steps to put things right by updating their guidance for relieving pressure sores, and the type of boots offered, which is in line with the new guidance in 2014; this was after your mother’s time in hospital. As the Trust have already taken steps to put things right, we will not be asking the Trust to take any further action on this and our decision remains the same. As the investigation process is largely carried out ‘in secret’ it will not be until you receive the draft report that you will find that PHSO have (mis)used the evidence to draw illogical and unsubstantiated conclusions which deny uphold. You have said that your mother had not eaten anything and had very little fluids for more than 36 hours prior to the discharge. You said she should not have been discharged in this condition. Our advisers have reviewed all of the relevant information in relation to the discharge and we do not consider that she was unreasonably discharged. We can appreciate that she deteriorated further in the discharge lounge and she was readmitted. However our advisers have taken the overall clinical picture into account and your mother not eating and limited drinking was in line with how unwell she really was. lt would not be expected for her to be eating or drinking, given how unwell she was. Our decision has not changed on this aspect. So it seems she was so unwell it was OK to discharge her!!? The Trust actually acknowledged the discharge was inappropriate and apologised and arranged for a review of discharge procedures but this was ignored by the PHSO in their desire not to uphold the complaint. the PHSO agreed that it wasn’t necessary to write on the discharge summary that my husband had been given a CT scan of the brain that showed brain damage, the PHSO agree with the Trust that the diagnosing of old brain damage (husband was in a coma for nearly three days), was a ‘fairly common mistake made by general radiologists to make, the PHSO agreed that it was acceptable that if thinking the brain damage was old it was feasible that no neurological input was necessary, even though my husband was admitted with GCS8 coma. 7. Ignoring comments made by the complainant on the draft report. Once you have the draft report you have the chance to correct any errors. However, all too often PHSO will simply ignore any comments you make at this stage and plough straight onto the final report which is identical to the first despite pages of comments from the complainant. The report which was sent to you on 8 March 2016 was our draft report with our provisional findings. This was explained in the covering letter that came with the report. We offer both the complainant and the Trust an opportunity to comment before we reach our final decision. As you have not provided any new information and the majority of your comments are reiterating your original complaint, our decision has not changed. Therefore, our final decision and final report has now been issued. More boilerplate. They give the complainant a chance to provide comments on the draft report before ignoring them completely. We are sorry to hear that you feel ‘the report leans heavily towards favouring the hospital’s account of events and does not give any credibility to my personal testimony.’ I can reassure you that we have carefully considered all the available evidence, including what you told us, in order to reach an independent and impartial view on your complaint. 8. Sharing report with the public body before sharing with the complainant. These snippets of evidence, coupled with those contained in the reports presented by the Patients Association should give you, Mr. Behrens, cause for concern. Apart from anything else, the uphold figures for PHSO, particularly regarding parliamentary complaints (less than 5% uphold) are reminiscent of the voting return for a corrupt despot who has total control to manipulate the figures at will. Previous Previous post: A report from the genesis of HSIB. Patient centred at heart? Next Next post: Mr Behrens, our new Ombudsman, wants to hear from you. There can be no change without throwing out the present system. All anyone is proposing is a couple of twiddles. The power is still all with the ombudsman – it is simply judge and jury. And it’s privilege is to control all the information, as continental judges do. So you will never know the alternative case paperwork. Or the whole of what went on. So how can you challenge it? Once the ombudsman draws a line under your case, you’ve basically had it. Even if you go for a judicial review and win, all that the court will do is pick up the negligent legal point… the PHSO ‘re-does’ the point – this time in the legal way ….and it ends there. The only chance you really have is via the media. If your case upsets Jeremy Hunt, he can order a new investigation. But it has to be something politically sensitive for this to work. I’m afraid to say that the DPA doesn’t provide you with all files. The PHSO does not let you see the Public Authority argument anyway. The DPA stops you seeing any legal stuff. Names will be redacted. So it may be difficult to see who did what. Also you cannot sue the investigator for negligence. They are also protected by the PHSO – the way it was set up. Annoying, I know. But ALL the cards have been dealt in the PHSO’s favour. The only real help was external advisors, who knew their subject. One thing. Don’t, whatever you do, loose your temper. One hasty accusative comment ……and the PHSO can shut you down entirely. And the PHSO is very good at doing that. So think hard and think twice before you send that email in a temper. jatroa Many thanks your advice and good wishes.. I got all I need under the DPA from the Ombudsman office. I also received a written apology, from the investigator who got it wrong, two months after his final report. I also have letters from two directors stating that he did not get it wrong. A clear case of conflict of interest. In things like this I never lose my temper as I spent 30 years doing business with the USSR and had to put up with far worse than the PHSO ever failed to do. Bunch of amateurs in my opinion. When I received the report from PHSO clinical advisor , I held it up to the light to the see the name of PHSO’s investigator…but they hadn’t redacted anyone’ s name!! ( I have another complaint which has the name ( redacted)- of PHSO’s investigator)….their investigator didn’t even have a university degree…..maybe they don’t exist…. Once HISB have sorted the NHS they ought to move on and investigate the PHSO’s clinical advisors….who, yes you’ve guessed it, work for the nhs! No nepotism in this company, uncle! Maz unfortunately the HSIB only plan to investigate 30 complaints per year as they do not have the staff or funding to do more. They also have no more powers than PHSO. Might as well go straight to a no win no fee lawyer and not waste time with Government bodies who cover up for the NHS and for themselves . . This information was provided by patient on line who are a great source of information. When you see how ridiculous their responses are, it really brings it home. Yep, people that pursue complaints for years do it because they feel so very strongly that wrong has been done, not because they like moaning and reliving the nightmare they have been through. Your blog sums up how we are made to feel. Agree with Jatroa – good point about Jeremy Hunt and the media. Sad but true. CS the media do not care as the issue is far to common to interest them. Jeremy Hunt is too far from the problem to do anything about do anything about the cover ups practiced by individuals in the NHS and the PHSO. Brilliant article. This shows, without doubt, that there is something criminally wrong in the complaints procedure. To cover up and skew facts is against the law, but then we are dealing with the law makers. All we can do is stand firm and keep poking the authorities in the ribs until they lash out and uncover their wrong doings. Eventually the truth will out. Teresa. Totally agree . My solicitor is now building case for court against the Trust and Social Services . who left me to suffer the long terms consequences of Sepsis. I am now permanently disabled as a result of their failure to recognise the symptoms of Septicaemia for over 6 days . My journey 1st adjudication after false start sick investigator disappeared didn’t even tell me. 2nd investigator one shortcoming relayed by phone. I relayed my upsetness, & anger huge anger threatened legal action 2nd review one failing even more anger comments in and letter written to Rob Behrens another review ‘a robust review’ scope amended to what The Trust allowed the PHSO to investigate – 4 failures! partly upheld – PHSO now worried that evidence I have re change of scope that had to be ‘agreed’ by trust & consultants & will be submitted via comments yet again Quote from CS Mr Behrens is looking into similar issues regarding the biased scope and PHSO welcome this feedback which we will look at and learn from’ Does that mean I will get fully upheld in a contentious death complaint after my comments are in? Absolutely not fit for purpose Mr Behrens we, the victims hang onto to the ethos of your tweets saying how ‘impartiality ‘ & evidence are essential for arbitration yes I agree but I now know PHSO interpretation of these couldn’t be further from the truth. I sensed the anguish from PHSO staff it’s hard on the decent folk there who are trying to make a living, they hang on there themselves because they wouldn’t get better rates outside PHSO They absolutely know what we are going through, I absolutely know what they are going through. If anyone interested will be publishing the whole dreadful affair once finished. Jeremy Hunt please either stop this PHSO farce or put it straight in truthful order. Sue – this is a very good account of your experience of PHSO. Can I repost this on the ‘things people say about phso’ page as a warning to others? Keep going guys.. We are all in this together ! This is very alarming and insidious for a Public Service to be getting away with. “concerned [we copied] draft report [to defendant] without sending it to you. When we propose to partly or fully uphold a complaint, we often send it to the organisation concerned to let them comment on the shortcomings we have identified. This CAUSE, strangely, is not shared with you. So the last word IS THE DEFENDANTS – even though the PHSO has ended its (month’s, year’s, decade long?) “rigorous process of investigation of the ‘evidence'”. Of the “cause to reconsider findings”? In my case it could not have been “New Evidence” – which is the only way a Complainant is permitted reconsideration – it was that BSMHFT (one of the Defendants) could not stomach the PHSO’s findings, even though it was a fraction of the negligence committed leading to my sons unsupported and isolated death. The PHSO could not even recognise that lies were told against the evidence held – such was their rigour in investigation. NO: this is an outward lie. And findings were “DISCUSSED” with Defendant? Such privilege! The same opportunity is NOT given; and the [second] draft not “shared” but presented fait-accompli as a supposed ‘Final Outcome’. The PHSO was working to an agenda deadline, made clear when requesting to see all communications. This is ONE illustration of devious tactics the PHSO reverts-to when out of their depth and tired of questions, questions. It is against all published Principles, and against all much publicised promises I’ve heard over ten years with regard to fair and transparent so called Judgements made by the PHSO. Hence the unresolved Historic Cases becoming more ‘historic’ every day we hear this sort of claptrap from the ‘Top’.